University of Hawaii News covers our project, with video! In the photo, Katie Mulliken uses a hand lens to closely examine a piece of rock as she logs scientific information about the core in the box. Apologies for the lack of updates, I can assure you that many hours of behind-the-scenes planning and preparation have occurred since the last post with regard to the project. Additionally, we now have a new home for these updates here on the new HGGRC website via the University of Hawaii's (UH) Hawaii Institute of Geophysics and Planetology (HIGP). Near the end of last November, local and national specialists came to the drill site (see photo) to assist us with perforating the casing with directional explosives. For the perforation job, total of ~400 quarter-sized directional charges were lowered into the borehole between 2000 and 2200 ft, and remotely detonated from the surface. Each charge created a hole ~1/2 inch in diameter in the steel casing, allowing groundwater to freely flow through this depth region of the borehole. The perforations are necessary for our upcoming pump test of the hole, which is projected to take place next month. This test will provide crucial information about the recharge rate of the groundwater resource at PTA, which will help the Army decide how best to utilize this resource. The pump test itself will also be no small feat of engineering, as we will be using a specialized cavity displacement pump to fit inside the narrow (4" diameter) casing. I'll post another update around the dates of the pump test. Once that test is complete, we'll be moving the rig and all our equipment ~11 km west to the second drill site for hole #2. The concrete slab and drilling cellar for the rig have already been poured and set at the second site, and additional site preparation is currently under way. Once drilling of the second hole begins, this site will be updated nearly every day when drilling activities are up and running. Last week we spent three days up at the PTA borehole site with distinguished guest Dr. Wendy M. Calvin from the University of Nevada at Reno. She showed us how to use a field spectrometer to take spot spectral scans of secondary minerals that formed in the lower half of the borehole (~3,000-6,000 ft below the surface). These minerals grew due to chemical weathering interaction between groundwater and the rock. Now that the data has been collected, we'll be working and corresponding with Dr. Calvin to more accurately identify the main set of secondary minerals that are present in the hole. These minerals will provide more information about the water and other resources deep in the borehole. In the photo below, Dr. Calvin performs a spot scan while technician David Dow prepares the next box for scanning and Dr. Nicole Lautze takes notes on each scan location. Drilling hand Donnie Mulliken also assists in the background with unstacking and re-stacking pallets of core boxes. Although there hasn't been a blog post on this site in a while, we have been busy planning for the second borehole and a water pump test of the first hole. The pump test will happen first, stay tuned for pictures of that activity when it happens this summer! Aloha blog followers, our project was recently covered in the local Hawaii Tribune-Herald newspaper here. Since the last blog post, we have presented preliminary results at the American Geophysical Union fall conference and arranged additional collaboration with scientists eager to study different aspects of the rocks and borehole. We are currently involved in a number of behind-the-scenes activities in preparation for drilling the second hole, and the news article coincides with the permitting process for the second hole being under way. Stay tuned for a post showing startup activities, hopefully within the next few months. Over the past few weeks we have continued to stay busy working on the rock core. We finished logging at the end of August, and started right up on editing the logs for consistency and clarity. So far, we have edited up to about Box 400 (~1670 feet). In addition to these activities, we also spent a couple days earlier this week taking preliminary samples from throughout much of the hole. 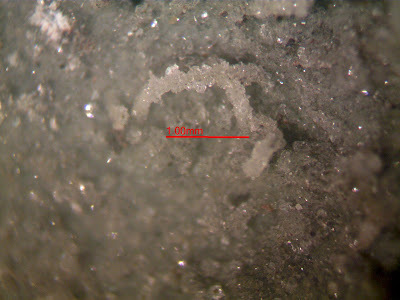 In the photo above there are 32 whole-rock samples made up of twenty aphyric rocks, seven intrusive units, and five picrites (>12% olivine). The chemistry of these samples will be analyzed over the next couple months, and hopefully at least a few of them will be suitable for Ar-Ar dating as well. The results of this preliminary work will then form the basis of further proposals to study the rocks in greater detail. 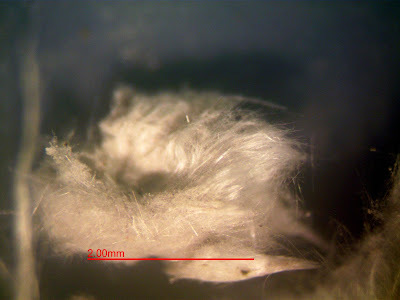 Both photos were taken at 40X magnification, and are probably different minerals of the zeolite family commonly formed by weathering of Hawaii basalts. The upper photo shows a worm-shaped pattern of crystal growth that is unlike anything we've seen before, but there is very little of that material that is easy to extract. We have gathered enough of the fibrous material in the lower photo that we can analyze in the near future via X-Ray Diffraction (XRD). Upcoming work to be done soon: Finishing the logging and editing all the logs for consistency, compiling a graphical log showing the stratigraphy of the hole, and sampling throughout the hole for preliminary analyses that will spur research proposal efforts. This past weekend was an eventful one for our project, we hosted a visit from a number of prestigious geologists who would like to study the recovered rocks. Over the course of the weekend, our visitors reviewed many notable rock depth intervals from the drill hole. They also discussed what the most urgent scientific questions might be that study of these rocks could answer. I would like to thank these visitors again for making the trip and braving the dust, wind, and heavy lifting required to get a firsthand look at the rock samples. Mahalo! Above is a photo of our visitors and some of our crew posing with the drill rig. From bottom left to right: Dr. Michael Garcia (UH Manoa), Rock & Data Manager Eric Haskins (UH Manoa), Dr. Nicole Lautze (UH Manoa), Dr. J. Michael Rhodes (UMass), and Principal Investigator Donald Thomas (UH Manoa). Dr. Donald DePaolo (UC Berkeley) stands halfway up the stairs. Top row from left to right: Core Processing Technician Brandon Jasper (UH Hilo), Core Processing Technician Meghann Decker (UH Hilo), Dr. Edward Stolper (CalTech), and Core Processing Technician Bryan Patterson (UH Hilo). Photo courtesy of undergraduate Kaʻo Sutton (Carleton College). PhDs are listed with their employing institution, graduates with their degree-granting institution. Below is an image of most of these people reviewing and discussing some of the rock core boxes (Kaʻo Sutton second from right).